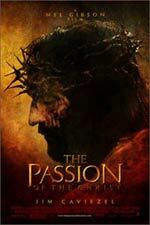 Mel Gibson’s “The Passion of the Christ” is not a film about Jesus. It is also not a film about history or figures that move through history affecting humanity and the events of history. It is a film about Christianity. More to the point, it is a clumsily packaged Hollywood depiction of 1,500 years of Catholicism. It is religious propaganda. And I do not use the term pejoratively. Every piece of art with a point of view is more or less propaganda, but let’s call a spade a spade: If Gibson, a devout traditionalist Catholic, set forth to espouse his faith and depict the center of his own passion; mission accomplished. But this movie, like Christianity, has nothing to do with any Jesus of Nazareth. Let me put it this way; “Passion” is not unlike Oliver Stone’s “JFK”. Not too much JFK in there, unless we see his head coming apart on his wife’s lap. No PT-109, no Harvard, no senator, no president, or Bay of Pigs, or Cuban Missile Crisis or Marilyn Monroe. His head coming apart. Over and over and over. “JFK” is about assassination theories. “Passion” is about the Christian obsession with sacrificial blood ritual. Watching this film took me back to the days of sitting in church as a kid and expecting to see or hear anything about Jesus underneath all the ritualistic dogma. It’s damned frustrating, and hard to argue that the context of which has inspired horror shows like the Crusades, the Spanish Inquisition and the Holocaust. But it also doesn’t mean it cannot be revisited as art either. Although, for me, it would have been more compelling had it not been more of the same damn thing. Beyond the ultra-Hollywood violence – jacked up a notch for the video game generation – we get the usual stuff here. Christ dying for our sins. He comes. He dies. End of story. No back-story. No politics. No spirituality. No philosophy. No revolution. No mission. No life affirming usably enlightened theories about embracing empathy and discovering divinity. Suffering. Death. Good drama. Big box office, but no Jesus. Once again, we get lifeless puppet characters playing their parts in a suicide pact with God, sufficiently answering the question, “Who killed Jesus Christ?” Because when viewed through the lens of Biblical faith – replete with the Lord killing innocents all over the place – and all the evidence in Gibson’s film, the verdict is clear: God killed Christ. Or, more to the point of Gibson’s way of thinking, we forced God to kill him. Kind of like the Jewish authorities forcing Pontius Pilate to kill Christ. Admittedly, the thing is aptly named. After all it is “The Passion of the Christ”, although I would have preferred, “Jesus Gets it for Opening His Big Mouth”, or “This is What Happens When One Love’s One’s Enemies”. I didn’t think it was possible, but Mel Gibson actually succeeds in portraying a completely empty depiction of Jesus Christ. But it’s hard to argue that the very essence of the gospel’s enlightened Nazarene, a charismatic healer exalted by an inspiring philosophy leading a penetratingly gorgeous spiritual movement is sucked right out. In its stead we have a pawn for sadomasochistic mayhem; what I like to call the Euro-Christ. But even two millennium of Christian rhetoric has yet to erase the impact of the historical Yeshua of Nazareth, from the Council of Nicea to “Godspell”. Yet this movie manages to do it. I didn’t think it was possible, but Mel Gibson actually succeeds in portraying a completely empty depiction of Jesus Christ. Not that actor, James Caviezel doesn’t capture the Catholic Christ pretty well; a vessel for torture and death set up as humanity’s sacrificial lamb by the sadistic Lord God of the Israelites. He portrays a great punching dummy and the make-up people did a bang-up job. Lots of pain, but again, no Jesus. Lots of blood and suffering and reams of Catechism, but no Jesus. So, in a sense, “Passion” is the perfect Christian art, an animated version of Renaissance paintings, (Gibson claims he endeavored to recreate Caravaggio’s gruesome images) but not particularly good art at that; effective, in that it has caused a stir like most viable art, but poor in the literal sense. The way smearing a painting of the Virgin Mary in elephant dung is a sensationalistic artistic statement, but as a gripping, meaningful rendering, it’s lousy. As a movie, “Passion” is bad. The acting is predictably stiff, the set-design sub par for a Biblical epic, the music surprisingly non-descript and the directing ham-fisted. I usually don’t like religiously themed films, but most give me at least a moment of chills or reflection, an uplifting of heart or a distinct feeling of something. This thing drones from the opening frame and settles into two-dimensional drudgery. However, I cannot engage in hypocritical blather about “too much violence” here. You want to concentrate compulsively on first century Roman scourging and crucifixion as a means for redemption, fine; but its not going to be pretty. This kind of thing went on all the time in first century Jerusalem. Hundreds upon thousands slaughtered by Roman governors. Take a trip to Golgotha now and see if you don’t feel it. Not unlike, I’m sure, sitting in Auschwitz or Dachau today. But I would forget theological debate and historical content when judging “Passion”. It is poor storytelling packaged as a religious tool. Period. This might be great for some, namely fanatical Christians, but as forceful narrative, it is disappointing. And it is certainly no “true depiction” of historical events in any way, shape or form. Gibson picks and chooses his gospel versions like mad scientist forcing a solution. He might have been better off from a theological stand-point to stick with, say, the Gospel of John, which dominates most of the storyline, instead of jumping all over the Biblical map to suit an agenda. Although, once again, a good framework for religious theory, but hardly accurate. When I heard about this project some two years ago, I was finishing up the manuscript to my last book, a story based on my trip to Israel in search of the historical Jesus. I was excited about the prospect of hearing the gospel characters speak in their original dialect, and the promised “realistic depiction” of the ordinarily sanitized crucifixion scenes of earlier Hollywood efforts. But even I was left feeling I’d just seen the last ten minutes of “Scarface” for two hours. Finally, Gibson nor the actors, or anyone connected to the making of this thing should feel badly. Based on concepts like “Jesus Christ was born to suffer and die for the sins of humankind” and “in suffering there is cleansing” all the participants can be nothing if not merely chess pieces in a fixed game. And that is how the characters in this film go about their business, like marionettes marching in step to a mystical slaying. It is my fault for expecting to see anything else. The film’s popularity (beyond pure curiosity and pack mentality) speaks to the human condition to be drawn to signature moments that usurp the entirety of an event, or to miss it completely. We read about a warrior for peace slain in his prime and choose to remember him with a gory effigy of torture and death.